Corporate profits in the second quarter (both nominal and inflation-adjusted using the business sector price deflator) reached all-time record highs during the April-May period of this year, according to today's BEA report on GDP and corporate profits for the second quarter (see chart above). Real GDP growth in the second quarter was revised down from the previous estimate of 1.3% to 1%, based on more complete data. While overall economic growth remains weak as measured by real GDP, the record level of corporate profits shows that American companies are financially healthy and strong, and can easily weather the current spring-summer "soft patch." Compared to the cyclical low of $770 billion in the fourth quarter of 2008, real corporate profits have almost doubled to the current record level of $1,540 billion, which confirms the fact that corporate profitability has made a full recovery from the effects of the Great Recession. Based on post-war history, the U.S. economy has never experienced a recession that is not preceded by sharp declines in corporate profits, so I think we can safely say we're definitely not headed for a double-dip recession in the near future. GDP was revised down to 1% for Q2. federal government was up 2%, driving about half the growth. a great deal of this "profits growth" is "inventory adjustment". that's only valid if you can sell it. with real PCE so low, that's questionable. how can real profit growth be mirroring nominal so closely when the price index for GDP is up 3.3%? that ought to be causing the series to diverge, but they look to be in perfect parity. that doesn't seem to add up. actually, this is a good breakdown of the factors. growth was driven by defense and some durables investment. personal purchases of good were -0.34%, and personal purchases of durables were worse at -0.4%. services seemed much stronger at 0.64% but were still very weak and well below even the 1% GDP number. this all seems to point to a very tired, uncertain consumer who is not spending. that it hardly a surprise, but does not bode well for coming quarters. you can see this knocking on into july and aug manufacturing surveys, several of which (philly, filly state survey (national)) are already showing recession. this is not going to be a pretty H2 of 2011. I guess that if you change the FASB standards to allow the financial system to use make believe valuations when reporting you can come up with any profit number that you want. But in the non-financial world in which we all live it is not possible to escape the consequences of reality forever by ignoring it. At best we can kick the can down the road and pretend that things are better than they actually are until the next election cycle is over. But that will not prevent the eventual collapse of the banking system or the currency. To save one the other has to be left to die. "Current-production cash flow (net cash flow with inventory valuation adjustment) -- the internal funds available to corporations for investment -- increased $83.8 billion in the second quarter compared with an increase of $21.1 billion in the first." This should be a very strong incentive for corporate capital expenditures to continue to rise. one could also interpret that as meaning that corporations are hoarding money out of fear of the future and a lack of current opportunities. this would seem to be borne out by the conversations with CEO/CFO's i have been having and the punk consumer demand. if consumer purchases of goods are down, why invest? The private sector is amazing, and adapting. They will make lots of money. The naysayers here under-estimate human innovation. We should do everything we can to expand the private sector, including serious reduction in military outlays, a trim of entitlements, and elimination of the USDA. Yes, the non-profit sector will always be ossified and bloated. Coprolite defines federal agencies, including Defense, VA and Homeland Security, that eat up the majority of federal income taxes. a bit off topic, but i am loving the market's slap in the face to QE. the tape is down on a bad GDP revision. bernenke says he's not going to do any more damn fool stuff like QE right now, and we get nearly 400 point dow rally. morganovih, the cash flow increase ($20 billion for one quarter)is greater than the yearly GDP of Ghana and 140 other countries! And yet the right says if only we had more tax cuts for the rich, more reductions in regulations (for increased profits) then we'd finally turn this economy around. Reagan says give the rich more and they'll invest and make us all wealthier. So we give them all the money like Reagan suggests. Bush goes even further. Obama extends that. The rich have more than ever. And for the rest it's a disaster. You and the government are not "giving the rich" anything by reducing their tax burden, with few exceptions, they have earned it. Where does your sense of entitlement to the fruits of another mans labor come from? As for the actual giving, that was done when the government decided to grant and to subsidize mortgages to people that could not afford them based on some twisted notion of "social justice". That is what has led to this disaster. If you and your lefty friends would just stop the social engineering and stop trying to make the world conform to your sense of "fairness" we would all be better off. I'm not predicting two quarters of declining GDP. 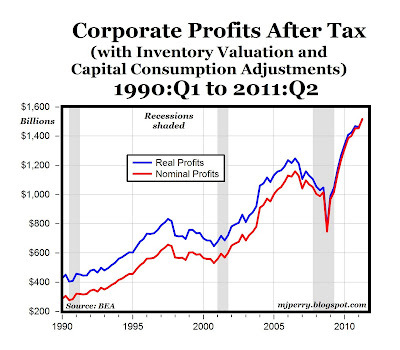 But back in 2007, corporate profits looked pretty good also. "morganovih, the cash flow increase ($20 billion for one quarter)is greater than the yearly GDP of Ghana and 140 other countries!" yeah, but in the US, that annualized growth of 80bn is only 0.5% of GDP, hardly a robust number. og, yeah, the 80's and 90's were a terrible time to be an american. what on earth are you smoking? that was the greatest gain of wealth in recorded history. the problems started in 2000 when greenspan thought that just printing money would fix the .com bubble. since then, ultra loose fed policy has given us 12 year of growth at 3% a year below the 80's-90's. the real estate bust it caused will be with us for a long time. there is no quick fix for that where the cure is not worse than the disease. our problem is an activist fed and an activist federal government creating tax and regulatory uncertainty in the same way that hoover ans especially FDR froze things in the 30's. if low taxes were the problem, then you would have seen it in the 80-00 period. federal tax receipts as a % of GDP (per hausers law) looked exactly like the 60's and 70's, you just had better growth. 2000+ has been hamstrung by concatenated bubbles and chronic unreported inflation. this gives us low and negative real growth, negative real interest rates, rapid bubble formation, and huge debt accumulation. you want o find the source of the problems, look there. there is ZERO evidence to support your contention that low taxes are the issue. I looked at the tables in the BEA report. When you look at corporate profits for domestic industries (with inventory valuation adjustment), the profits in 2Q10 were $1.469 Trillion. For 2Q11, they were $1.388 Trillion or a drop of 5.5% from the same quarter a year ago. I agree that they earned their money, Che. I'd add that they got some help. They all use technology developed with public monies (computers, the interenet, satellite communications, interstate highways, shipping technology, commercial aviation) Many of these companies, like Boeing, Honeywell, etc get their by feeding at the public trough. But that's not to say they aren't deserving of earnings. But my point is, with surging and record profits why should we accept the claim from right wingers that we just need more tax cuts for the wealthy? The effect of that is to put more money in the pockets of the rich. Their pockets are bursting now and they aren't hiring. Morganvich, you say there is zero evidence that taxes are part of the problem. The period of highest growth since WWII is the period that corresponds with extremely progressive taxation. Top marginal rates were like 90%. Effective rates for the wealthiest were near 70%. Reagan's tax cuts have corresponded with a total collapse in economic growth. Expanding inequality. Longer working hours with an astonishing drop in hourly pay since 1970. Exploding deficits, stagnant wages for the middle class, declining wages for the poor. An unmitigated failure. The brief turn around was after Clinton raised taxes. But Bush brought that to an end and Obama has extended the Bush policies. The result? 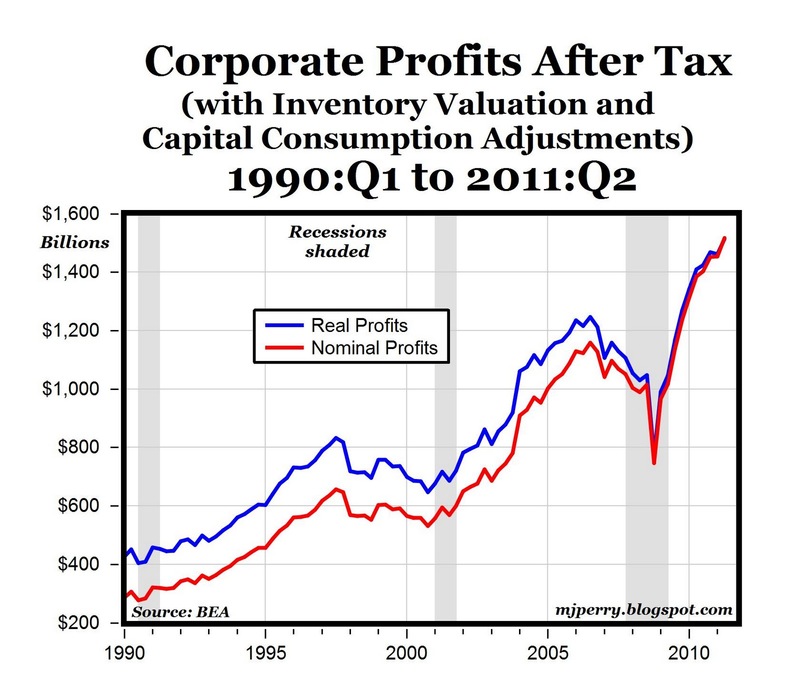 Record corporate profits. Wages for the bottom 80% of the population are falling. Compounding the failures. The right's prescription? More of the same. And when all the evidence is against you, turn to the unmeasurable and unfalsifiable excuses. It's all due to "uncertainty" regarding regulation and taxes. How do we know that? We know what worked. Progressive taxation and regulation, especially of the financial markets. Why wasn't uncertainty a problem then? Right wingers must make excuses for their dismal record. The Fed doesn't and shouldn't micromanage the economy. It's not important how many booms and busts take place in asset markets, whether the Fed Funds Rate is 20% or zero, or if the money supply is high or low. What's important is sustainable growth (of goods & services). Jon, ignoring factors with more explanatory power or ignoring 95% of the economy will most likely lead to wrong, if not ridiculous, conclusions. No one wants to work twice as hard for the same standard of living (e.g. in California). In a high-wage country, e.g. the U.S., government raising the cost of living (for everyone) has lowered living standards (particularly for the masses) more than (some) market wages. Government does produce some good. However, if it was sold at a store, you wouldn't buy it. So, government has to buy it for you. Did you sleep through Econ 101 or did you flunk the course outright Jon? Raising taxes on the upper class may result in fewer corporate jets, yachts, lamborghinis, etc. So, states may collect less sales and luxury taxes, while some workers who produce, sell, maintain, and service those goods lose their jobs. It's uncertain if government will collect more taxes than it loses (when lost jobs are included). Or perhaps, businesses will raise prices to make up for higher taxes. Of course, government can shift that money from the rich to the poor. However, I suspect, for each $1 the government collects, only $0.80 will reach the poor after the bureaucratic process is completed. And then much of that $0.80 will be squandered by the poor. The government could instead spend the $1 to produce something worth $0.50. So, to be a successful capitalist, you need to buy a truck, a lawnmower, and an illegal alien for $5 an hour to mow at least 20 yards or 20 acres in eight hours for at least $10 an hour. Or invent a lawnmower that doesn't require people. It is true that the free market can adapt and that innovation is very important. What you fail to miss is the fact that innovation is being held back by government regulations and threats of confiscatory taxes. You should let the private sector compete. Period. Not only does that mean less government spending on the military and entitlement reform but it also requires the removal of tariff protection for inefficient companies and the elimination of all subsidies. No. The right has argued that taxes should be cut for everyone. Since the rich pay most of the taxes it only makes sense they would be the biggest beneficiaries from tax cuts. Of course, the poor can't really complain because they get transfer payments from taxes paid by people who actually work and earn income above a certain threshold. Reagan says give the rich more and they'll invest and make us all wealthier. True. The problem was that Reagan and Tip Oneil's Congress spent like drunken sailors because none of the agreed spending cuts were ever implemented. So we give them all the money like Reagan suggests. Bush goes even further. Obama extends that. The rich have more than ever. And for the rest it's a disaster. On what planet do you live? Most of the income taxes are paid by the 'rich' while the bottom 50% pay almost no federal income tax. The poor get subsidized by tax payments made by the so-called rich. It seems to me that the poor have a very good thing going. Unfortunately, their greed seems to have killed the golden goose. The US has the highest corporate tax rates in the OECD and has the most restrictive regulatory system. That makes those that have capital very reluctant to invest it inside the US so more and more productive activities are moving abroad. Like the EU, the US is in huge trouble because the path to socialism cannot solve real problems in the real world. Where does your sense of entitlement to the fruits of another mans labor come from? You know the answer to this. Your friend is a Marxist. He still thinks that the Cuban experiment was a good idea and has yet to admit that central planning does not work. This is wishful thinking. Socialists cannot oppose the Welfare State any more than the Right can oppose the Warfare State. The false boom was purchased by money printing and loose money policies. When people were valuing companies by metrics that included 'eyeballs' and becoming millionaires overnight even though their companies had no profits, wealth was not really created. No. The problem began much sooner. In 1987 Greenspan used the printing presses to prevent a needed correction. He was praised as a genius. He continued to use the same tricks in the early 1990s, 1995, 1997, and 2000. By preventing corrections and blowing new bubbles Greenspan ensured that the end game would be very brutal and cause a great deal of damage. For the record, we are not yet near the end. When the bell rings to signal a bottom the Dow will sell for one ounce of gold or less and silver will be in the high triple figures. Here I disagree. We have to have a liquidation of malinvestments so that the economy can be based on a sound foundation. If we choose to kick the can down the road the distortions will become much larger and the eventual dislocation will be far more brutal. Low taxes are not a problem. But the huge increase in the debt and the unfunded liabilities are a massive problem that needs to be addressed. There is no 'public money'. The government taxes income using a progressive scale and spends for all kinds of things, including some projects that come up with technological breakthroughs. But you are forgetting that had the money been left in private hands we would have had more advances. Keep in mind that Bell Labs developed the technology that made hard drives possible in the 1930s and sat on the invention for nearly six decades. It took a competitive market to fully develop the potential of that discovery because Bell had no interest in using it to cut into its own business. You need a fairer tax system. At the moment the top 10% pays a disproportionate amount of taxes while the bottom 50% pays no income taxes. This is nonsense. First, most of the growth took place because WWII destroyed American competitors and created massive new markets for American goods. Second, the high tax rate was easy to get around for those that were very high earners. Businessmen had all kinds of structures and trusts available to them. I like the story of Bob Hope, who because a billionaire because of the high tax rates. Once he earned a certain amount there was no point in working for money so he worked for 'free' by trading his labour for options on land and properties in Nevada and California. Those options allowed him to acquire hundreds of millions of dollars in property with a payment of a few hundred thousand dollars. Enterprising individuals and the rich can always find ways to minimize their tax burden. What you are supporting will only harm those who started out poor and are trying to become rich. At some point the government will prevent them from accumulating capital because the tax burden will be too great and they will be in no position to avoid taxes by using techniques that are used by people who have more money. More nonsense. The Clinton 'boom' was a combination of very loose monetary policies, a change in accounting rules, and statistical slight of hand. When Bush came in the IT bubble had already burst and hundreds of billions of equity had vaporized. To prevent a correction the Fed simply started to print more money and created a housing bubble that Liberals and Conservatives were cheering on. And as usual, both sets of idiots got it wrong. >>> that's only valid if you can sell it. Perhaps some Offishil Fedral Gummint Lemnade Stands would solve the problem? Could it be that the real and nominal series references are inverted in this graph? Yes, the lines were mis-labeled and the mistake has been corrected. I apologize, and I thank you for letting me know.